Click Clusters in the Lifecycle Manager navigation menu. 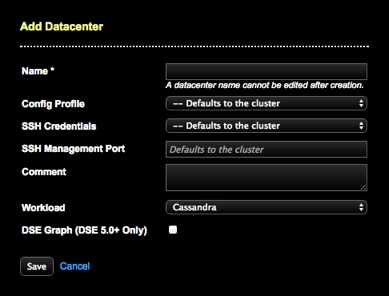 In the Clusters pane, select the cluster to which you want to add a datacenter. Details about the cluster are displayed. The Datacenters pane becomes visible. Click the + (plus) sign above the Datacenters pane. The Add Datacenter dialog appears. Required: Enter a unique Name for the datacenter. The datacenter name cannot be edited after clicking Save. Datacenter names must be unique within a cluster. Name Enter a name for the datacenter. Datacenter names must be unique within a cluster. Required. Config Profile Select a configuration file to apply at the datacenter level to override inheriting the configuration profile from the cluster level. SSH Credentials Select an SSH credential to apply at the datacenter level to override inheriting the credentials from the cluster level. SSH Management Port Enter a port value if you do not want to inherit the value from the cluster. 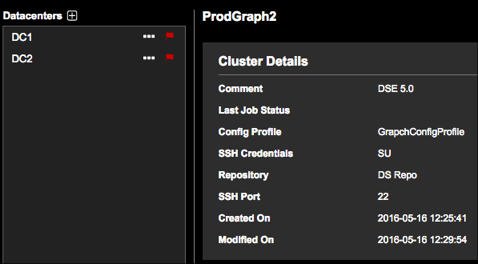 Default value for SSH port at the cluster level is 22. Comment Enter a comment about the datacenter that identifies its purpose or location. For example, DC East Coast Production DSE v5. DSE Graph (DSE 5.0+ only) Select the DSE Graph option if the datacenter is for a DSE Graph database. The newly added datacenter displays in the Datacenters pane of the Clusters page. The Datacenter Details display in the details area next to the cluster model panes. Add another datacenter. Repeat this procedure as necessary. Important: After the new datacenter has been added and the nodes are all online, you must change the replication strategy either manually with CQL or using OpsCenter. Run nodetool rebuild to propagate the datacenter with data. LCM does not perform those operations.